I've been doing a declutter and purge. I generally keep my house reasonably uncluttered. I think it comes from having grown up with a hoarder. I am an anti-hoarder. Except with books. And Beanie Babies. What do I do with 300 Beanie Babies now that no one else wants them? But I have taken a much more critical eye to my belongings than in years past. I got rid of several perfectly good shirts. But every time I reached for one, I would draw my hand back and say, "Umm. No.." The shirts deserve to be worn. Into the giveaway pile they went. Four years ago, I took down gorgeous, full length curtains I made for my 8' wide bedroom window. They clashed with a stained glass piece I hung in the same window. Do I really expect I would change my mind and rehang them? Or make something else out of them? I barely have time to finish the items on my to-do lists. When would I find time to take on a new project? Into the giveaway pile. I had some delicate gold necklaces with real (tiny) diamonds. I haven't worn them in at least 5 years. I have a lucky necklace I wear every day. So these necklaces have hung forlornly from a tie rack, pretty but forgotten. Into the giveaway pile. My hardest giveaway? Legos. I have accumulated 30 pounds of Legos. Some from when I had young step kids, but most were purchased for work. 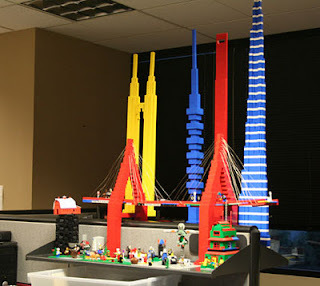 At one work place, I used Lego sets as a conversation starter. They were also useful to occupy fidgety people. At this workplace, we built an entire cityscape when we had down time compiling code on slow machines. But we moved offices and the buildings came down. We got faster computers and there was no down time. It's been over a year and the city has not been rebuilt. The Legos were stored in the garage, in transparent containers, reminding me that they were being unused, neglected. I couldn't bring myself to part with all of them. But I sorted all the colors and the people and gave away 2/3 of my Legos to 2 boys that will love them and play with them. My next step? Software disks. Do I really need to keep the disk for TurboTax 1999?